Between summer travel and summer heat, it’s been a quiet season for Boneyard Studios. But with cooling weather and lovely evenings ahead, we’re excited to announce another tiny house tour Thursday, September 15 at 6PM! After dozens and dozens of Sunday morning open houses, we’re curious to try out a weekday evening tour, aimed at those who may not be able to make it downtown on a weekend. The Matchbox (and only the Matchbox) will be open for viewing and a Q&A at 925 Rhode Island Avenue NW—home of Old City Farm & Guild, with a Metro stop, CaBi station, multiple bus stops, and plenty of bike parking (and car parking) nearby. Like always, we’ll start promptly with a general introduction, so please arrive on time. Afterwards you’ll be free to ask questions, take photographs, check out the space and its many small and off-grid features, and take a walk around the lovely urban farm right in the Matchbox’s backyard. Catch a few more details on Facebook here, or head on over and register here. Hope to see you on the 15th! It’s been a long year—three lovely locations, two messy moves, one little house just looking for home. And last week, the Matchbox moved yet again, available for tours and visits and concerts and much, much more very soon. Boneyard Studios has always been about local architecture, local arts, and local agriculture, and so we’re thrilled to be teaming up with the awesome folks at Old City Farm & Guild, the coolest urban garden center in the District. 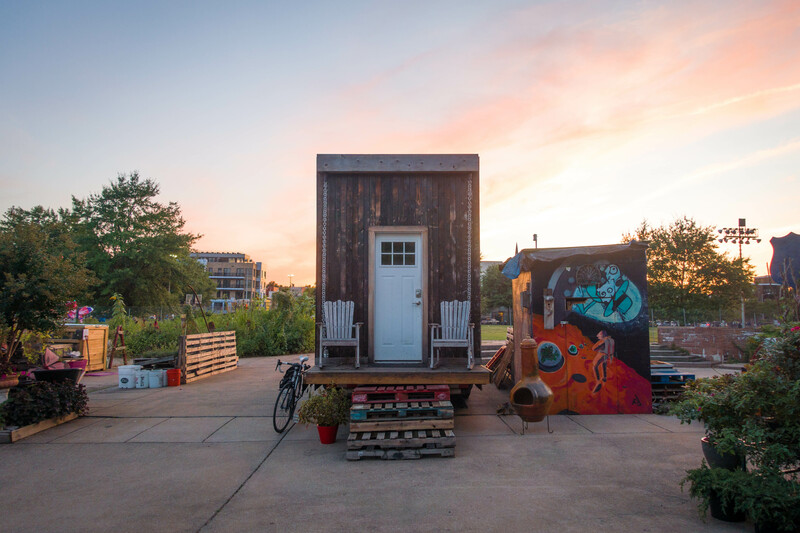 It’s a place where plants and people come together right in the center of the city (Shaw, to be exact), and this fall the Matchbox will be in the center of it all, adding some great tiny house events to Old City’s already wonderful set of community gatherings. It’s going to be a great autumn, and you’re welcome to join us in kicking things off right at the DC State Fair, hosted by Old City on Saturday, September 12 from 12PM to 8PM (more information here). Solar technology is awesome, but it’s also awesomely confusing. Between batteries and panels and chargers and inverters and controllers and more, figuring out a working solar system is a daunting task, especially when space is at a premium. A few weeks back, the Matchbox got solar, and so—in the hopes it’ll help someone looking to unplug a small house of their own—here’s the full scoop on my working solar set-up. To begin, this system was not cheap. Affordability was always a secondary concern for the Matchbox (trumped by reliability and livability), so at $8,400, these components may be out of the price range of some. It can be had for cheaper—indeed, I spent a little extra to order all the parts together, and a lot extra on a pre-wired FlexPower unit (which contains the charger, inverter, controller, and more), rather than risk death by electric trying to get those individual components wired together. Not cheap, not easy, but it does work. Well. Or at least, sort of. I’ve been running the system for a few weeks now and it does just great—even with my AC refrigerator and non-LED lighting, it drains less than 15% of the battery bank during an average day of use, and that’s without recharging. The thing is, the Matchbox currently rests under a pretty thick tree canopy, blocking all but the most indirect sun from touching the four panels on the roof. As such, it’s not really recharging—and won’t be able to until it moves to sunnier pastures—but once it can charge up, it should top the battery bank off fairly quickly. So, those are the caveats. These are the details. The panels: 4 SolarWorld SunModule 315W/24V monocrystalline panels. Your basic 315W panels. The Matchbox roof (and most other roughly 8′ x 20′ flat or slightly pitched roofs) can fit four, for a total 1.3kW array. The batteries: 4 Trojan Reliant L16-AGM 6V 370AH sealed batteries ($499 each, $1,996 total). Safe for small interiors, compact, and capable of storing 1,480 amp-hours (roughly 9kWh). Note that these particular batteries are pending recall for a non-urgent sealing issue, so perhaps the Trojan Reliant’s aren’t, well, all that reliant. The unit: FlexPower ONE VFX3524 pre-wired system, including AC/DC boxes, inverter/charger, FLEXmax charge controller, and MATE3 hub ($4,035 total). Perhaps overkill for such a small home, but magic nonetheless. Capable of charging batteries from the sun, inverting DC to AC and AC to DC, charging batteries from a hook-up or generator, and keeping everything running and monitored and safe. The odds and ends: connector cables (2), connector key (1), combiner box (1), locknuts (2), breakers (2), rails (4), end-clamps (2) and mid-clamps (1), l-foots (2), battery connectors (3), and battery cables (1), all totaling $507. Another $520 for Massachusetts-to-DC shipping, and about $100 in tools (crimpers, wire strippers) and parts (wire, ring connectors) from the hardware store. I got all this from the folks up at altE in Boxborough, MA, who were great in helping me figure out what I needed. They weren’t the cheapest, and this is in no way a paid referral, but feel free to use my sales order (SO-127929) as a starting point if it helps—or, y’know, comparing prices of the above links across the internet for the best deal. So, those are the parts, but in such a small house, where do they go? Well the panels, obviously, go on the roof, and take up most of the seating space up there (though this amazingly entertaining strength-testing video suggests they’re more than sturdy enough to sit on). The FlexPower unit goes where the electric fireplace used to go, taking up about 33″ x 20″ of wall space and jutting out about 13″ from its mounting plate. The batteries sit on the floor underneath, occupying about four square feet in the corner. And the circuit breakers go in a back bumpout, though these could easily be installed right next to the FlexPower unit. Altogether, the interior solar bits and pieces take up about as much space as a small corner desk might (a really small corner desk). It’s worth noting that the batteries and inverter/charger will give off heat, so best to keep them away from combustibles and be mindful of that heat during the warmer months. They’re also heavy. The main unit weighs 110 pounds, and each battery about 115, so assuming those are all tucked away in one corner of the house, that’s about 600 pounds shoved in one corner of a small, trailer-supported house. Considering another 200 pounds for the four panels (50 pounds each), a solar system of this size will add nearly 800 pounds to a tiny house—not an issue for those built on 14,000 GVWR trailers, but definitely a concern for a single-axle model. And, finally, your mileage wattage may vary. The Matchbox system is a good system for the Matchbox—or at least, it’s been doing okay so far—but solar is a big investment. Let me know if you have questions in the comments below, and I’ll let you know how the system does as we move into the hotter (and then colder) months, but whatever you do, get a second opinion before dropping thousands of dollars on a tiny house solar system. More pictures to come, but for now here’s another look at the unit and batteries. Three years ago, I dreamed of building a house—something small, something simple, something sustainable. And with the help of a great many friends and mentors and supporters and the long, endlessly rewarding patience of time, that dream became a house and that house became a home. And this week, that home became an ecosystem. This week, the Matchbox unplugged. The Matchbox was never so much a dream as it was a question: Can one find happiness in a simple life of simple limits? Can one live a life truly in harmony with her planet? Can one survive—and not just survive, but willfully thrive—with nothing but the sun and the rain and the earth below? It may be a long, trying journey to get there, but I think the answer is yes. For years now, the Matchbox has been “nearly” off-grid, self-sufficient in water and waste but still dependent on a constant source of city-supplied electricity. Until now. Over the past few weeks I’ve been working under the absolutely wonderful tutelage of Brad, friend of Boneyard Studios, to wire and install a state-of-the-art solar kit, and this past Sunday it went live. The custom kit features a 1,200-watt, four-panel array, four hefty batteries totaling 290 amp-hours, and an absolute beauty of a control center with an AC/DC inverter, charger, and communications hub. After running the house for three days under the thick tree canopy of the Matchbox’s (temporary) backyard, the batteries are still about two-thirds full, suggesting the array won’t have any trouble keeping up when moved into more direct sunlight. 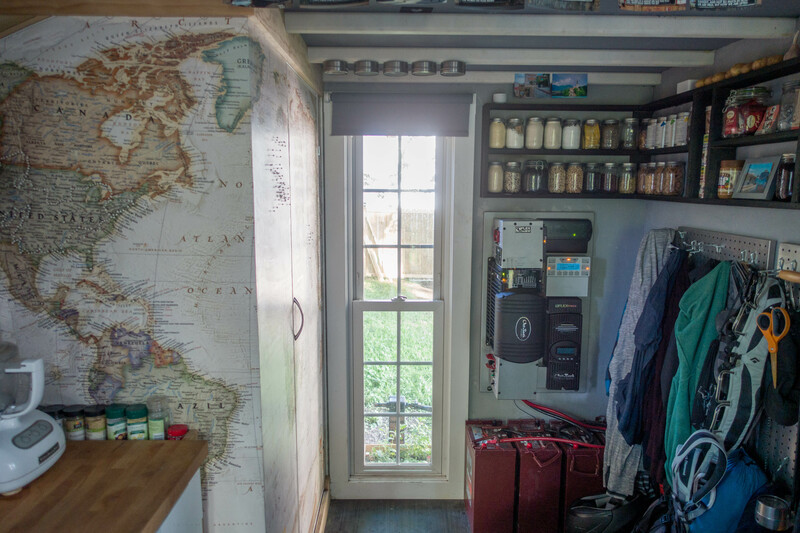 Coupled with the existing rain catchment system, greywater management, composting toilet, and fledgling garden, the Matchbox is—finally and proudly—a carbon-zero home, DC’s first and only fully off-grid small house. With rainbows come drinking water and with sunshine comes electricity and with greywater and compost comes fresh vegetables from the garden; and with all the above comes happiness and a whole lot of harmony with the world around us. Four 70-amp 6V batteries and a lovely FlexWare system. (Left to right:) Meg, Jo, Beth, and Amy. (Top:) Ms. March. The worst tiny house move, ever. A few months back, the Matchbox moved. It left its old, troubled home in Stronghold and rumbled on over to a quiet backyard in a quiet corner of Brookland. It was a tricky move—tight turns, a narrow alley, a crooked tree and a muddy ground and a bench so sunk into the soil that it took a bottlejack to pry it loose. It was tough, but after the three or four messy hours it took, I reflected on just how fun it had been. Not this time. Last weekend the Matchbox moved again, and this time there are no cute photographs of a tiny house on the road, no video snippets of those rain chains blowing in the wind. There’s only the nightmare of this weekend scarred into my memory: twenty hours of towing for two miles of movement. And, I suppose, a few lessons learned. First, some context: the Matchbox relocated from Brookland (where the wonderful landowners needed the yard back for a spring garden) to Ivy City (where a wonderful landowner has so generously offered to give it space for the time being). 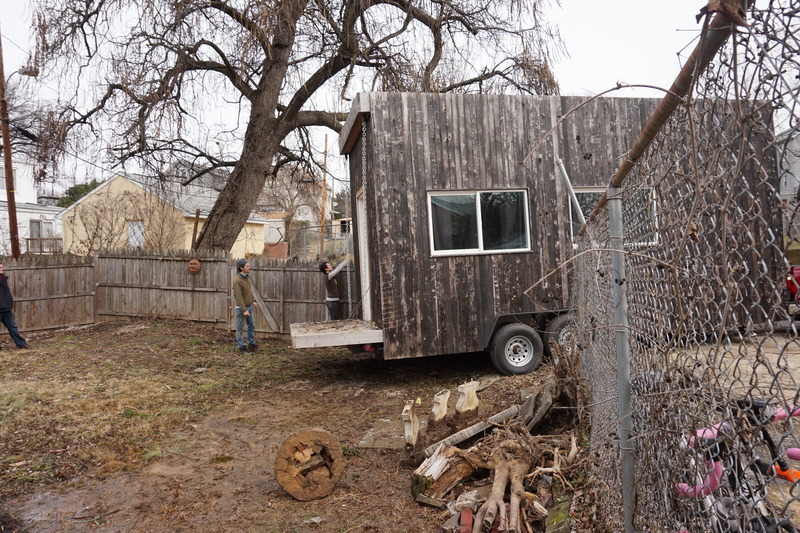 Our expert tiny house mover was out of town, and my attempts to find a reliable tower (or truck, for that matter) got me nowhere—tow companies didn’t want to tow the house, or didn’t have a pickup, or both. With no professionals available, I resorted to all I had at my disposal: a Ford F150 rental from Uhaul. I have no experience towing. This became immediately apparent as we got to work trying to pull the Matchbox out of the yard. First through the mud, tires spinning futilely, and then as we tried to haul the house around a tight corner, with an old tree leaning overhead, in reverse. Hours passed, progress was made, progress was lost. The hitch broke, the Matchbox’s siding got all scraped up, the back of the Ford sunk lower and lower into the ground. By late afternoon I’d all but given up. Despairing, I gave one of those tow companies a call—the one that had been most open to helping out, willing to come by if we were able to get it most of the way out. I wouldn’t say it was most of the way out (not even close), but Darnell from Scott’s Towing [note: this isn’t a solicited review; they’re just awesome] swung on over around 5PM with a much-needed smile and positive attitude. He took over behind the wheel and—after about an hour of maneuvering—freed my little house from its little alley prison. We hit the road and I biked behind and twenty minutes later we were in Ivy City, my new home for the next few months. Or, almost. It was growing dark and there was still work to do: tearing down a picket fence, backing the house into a(nother) tight yard. We didn’t want to rush things, so we parked the house on the street for the night (legal in DC as long as it’s attached to a vehicle), then got to work the next morning with tons more back-and-forth before finally, sometime around 7PM, settling the Matchbox into the quiet backyard. A full weekend, sun-ups to sun-downs, moving one little house. Nobody puts baby in the corner. Don’t squeeze a tiny house somewhere it won’t fit. Just don’t. Backing up will always be more difficult than pulling in, and just because you’ve managed to get something pushed into the deepest corner of a narrow alley doesn’t mean you’ll be able to get it out. There were a few terrifying moments this weekend where I truly believed my house would never be able to make it out in one piece, and it’d be a terrible shame to put a house on wheels only to immobilize it through sheer, stubborn geometry. All good on the plaster front. A lot of people have had concerns about the Matchbox’s earthen plaster walls (and the drywall underneath). Will it crack? they ask. Maybe one day, but not yet. In the past few months my house has gone through a pair of two-mile moves, with lots of bumping and dropping down curbs and potholes, and though four miles isn’t exactly a long haul, so far the walls haven’t shown even the slightest hint of cracking. People are awesome. Two sets of wonderful host families, two sets of spectacular volunteer moving crews. Big thanks to Raquel, Janet, Jenny, and their families for giving the Matchbox a home during our time as a tiny house community-in-exile, and tons of appreciation to Robin, Lee, Erum, Molly, Lauren, Alix, Josh, Micah, Bao, and Darnell(!) for hours of grueling, muddy, miserable work helping the Matchbox move. Of course, this is all just temporary. In a few months the Matchbox will move again, and this time (we hope) to a much more long-term home. More on that soon—including a really exciting upgrade to the (nearly off-grid) house—and lots more lessons from our time in transit. Looking to talk tiny houses in the meantime? Come join us for a movie and beer at Bardo next Friday! The Matchbox moving into Brookland back in January. The bright minds at Pinky Swear Productions thought it would be fun to stage a cycle of brief new plays in the wee homes. Each show is short — 15 minutes or so — and set in one of the often ingeniously efficient little units, several of which are actually being lived in part time. The audience is split into small groups and shepherded from station to station to see playlets about love, death, aging and coping. On Friday, we had the privilege of joining the actors, playwrights, production crew, and the friends and family of Pinky Swear for a lovely dress rehearsal, hopping from set to set for a wonderfully diverse collection of plays, all developed by local female writers. I can’t really offer an impartial review, of course—how could I not absolutely love seeing the Matchbox transformed into the lovers’ cabin of “Josie, June, and Death,” or be more-than-a-little moved by the break-up taking place in the Minim House’s “For Emma” as we come to terms with a tiny house break-up of our own? Impartial or not, the quirky, clever plays—”sweet, funny, and sad”—were a treat to witness, and totally worth a three-weekend displacement from my home as the show runs its course. Of course, they’re also a living, breathing example of what we’re all about at Boneyard Studios: awesome events, free space for artists, big silly dreams that always seem to work out. Oh, and you can check ’em out yourself for much less than a three-week displacement from your house—just $20, every cent of which goes straight to Pinky Swear and its army of hard-working (and really lovely) actors, playwrights, and the dozens of other people, props, and port-a-pottys they need to make these Tiny House Plays run. Remaining showtimes Saturday & Sunday, 10/4, 10/5, 10/11, and 10/12, 1PM, 3PM, 6PM, and 8PM. Tickets here.